A soup that’s vegan, dairy-free, gluten-free, paleo, AND super creamy? Yep, it exists! 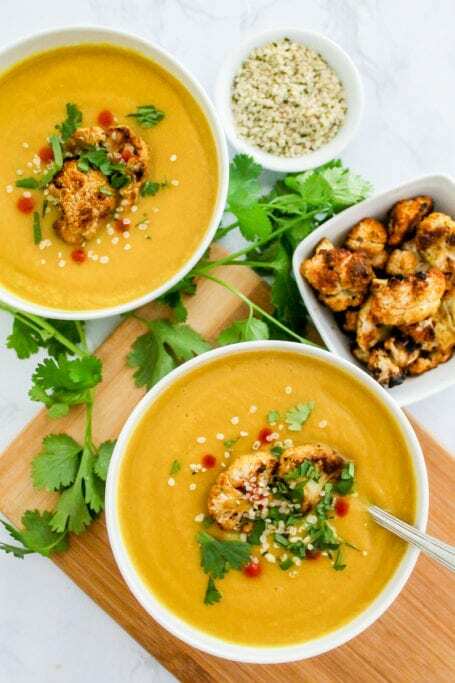 Made with ginger, turmeric and cauliflower, this Anti-Inflammatory Creamy Curried Cauliflower Soup is packed with warmth, antioxidants and nutrients to keep your immune system strong. Grab a spoon! Have you ever been in the middle of a workout, totally in the groove, feeling super motivated and pushing yourself and testing your strength, and then, something makes you go “Ohhhhhhhh sh*t.” This happened to me on Tuesday morning. I’ve been working a lot on mobility lately, particularly in my right hip and hamstring which, for whatever reason, likes to be tighter than my left side. To try to balance them out, I like to do a lot of single-leg/single-side work – Romanian deadlifts, split squats, hip thrusts… you get the idea. On Tuesday morning I decided to finish off my session with some kettlebell windmills which I haven’t done in for-evvv-er. (Demo here in case you’re unfamiliar.) With one kettlebell in each hand, I pushed one up above my head, one down at my side, and shifted my weight into my hip. A couple of reps in, I was feeling pretty good. But then it happened. No, my tights did not rip. I did not fart. Nothing visibly embarrassing happened, but in retrospect, neither of those things sounds that bad. But I did feel this really weird “thing” happen in the top of my right hamstring, that same area that’s been a bit high maintenance for the last couple of months. I stopped mid-movement, had that “Oooooh sh*t” thought, then stood back up and let the kettlebells go. Right then, I knew one of two things would come of this: I might be very, very sore, and probably not in a good way. The second (and more optimistic prediction) was that perhaps I’d released whatever tightness was causing me issues before, and that I’d feel a bajillion times better. I hoped really hard that this would be the case. I’d be lying if I said things weren’t feeling pretty darn tender right now, and let’s just say I think I’ll need to lay off those windmills for a while! On a positive note though, while luck hasn’t really been on my side this week, the meal prep gods have. 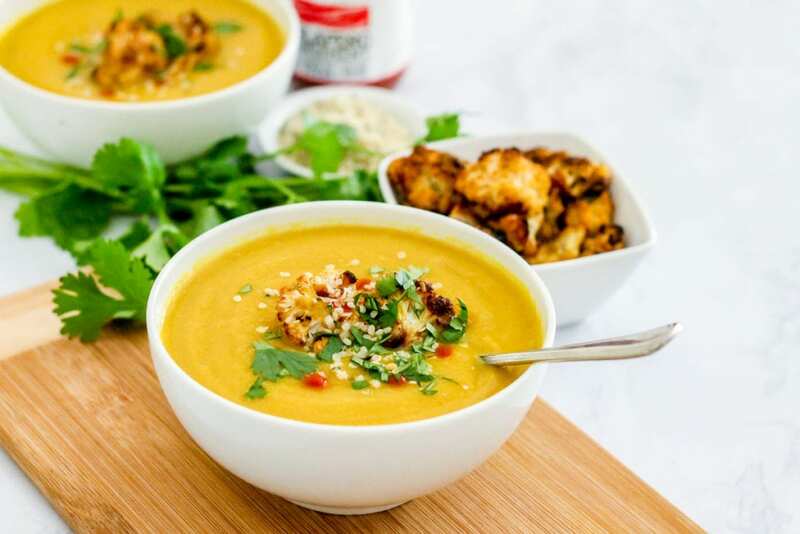 On Sunday I made this Anti-Inflammatory Creamy Curried Cauliflower Soup that ended up being so good, I went back to the grocery store for more cauliflower so I could make a bigger batch. That’s proven to be a great decision, because the turmeric and ginger inside have super potent anti-inflammatory properties – good news for my poor hammy, and for anyone dealing with muscle soreness or inflammation of any kind! Healing properties aside, this soup is absolutely delicious, warming, and packed with vitamin C. It’s also super creamy thanks to coconut milk and protein-packed hemp seeds – yet dairy-free, vegan and paleo too. Lastly, don’t you dare skip the crispy roasted cauliflower croutons because they are the BEST PART. Grab your biggest spoon! 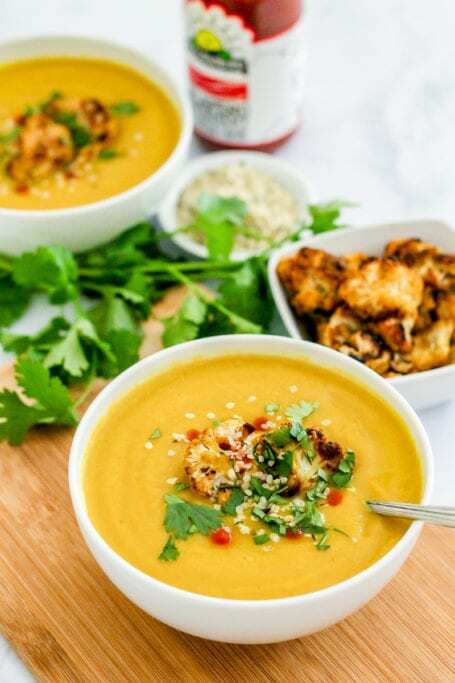 Made with garlic, turmeric and ginger, this Anti-Inflammatory Creamy Curried Cauliflower Soup is an amazing healing blend that’ll keep you warm on the chilliest of days. It’s vegan, paleo, dairy-free and gluten-free, plus packed with vitamin C for a strong immune system. Scatter them in a single layer on the baking sheet. Roast for ~20 mins, flipping around half way for even cooking. If you want them extra crisp, switch your oven the broil setting for the last 2-3 minutes. Melt the coconut oil in a large pot. Sautee the garlic and onion for about 2 minutes, or until fragrant. Add the chopped onion, cauliflower florets, spices and 1/2 cup broth. Stir fry on high heat for about 3-4 mins, or until the cauliflower and onion start to soften and the mixture becomes fragrant. Add the remaining broth and coconut milk. Bring to a boil, stirring occasionally. Reduce heat, cover with a lid, and simmer for 10 minutes. Remove the pot from the heat completely. Let it cool for at least 5 minutes before carefully transferring (in batches, if needed) to blender. Alternatively, use an immersion blender directly in the pot. Puree until smooth. Add the hemp seeds and continue blending, again until smooth. 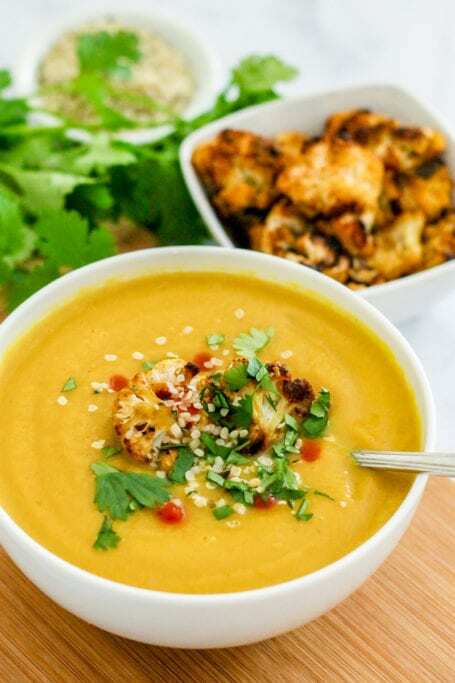 Ladle into bowls and garnish with cauliflower croutons, hot sauce, cilantro and hemp seeds. 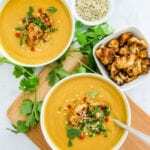 Tell me… do you have a favourite fall soup recipe?